Morecambe Bay is the UK’s largest expanse of mudflats and sand, reaching from Barrow-in-Furness to Fleetwood. Surrounded by saltmarshes and estuaries, it is beautiful but deadly: there are large areas of quicksand which move day to day, and water can move in at over 10mph over the miles of bay. BS&R was formed to develop the right capabilities to rescue people from the bay: boats are unusable in areas where water turns to sand in seconds; tractors can easily disappear into quicksand ‘lakes’ 3 metres or more deep. In 1996 a near tragedy was a catalyst to the formation of a BS&R. 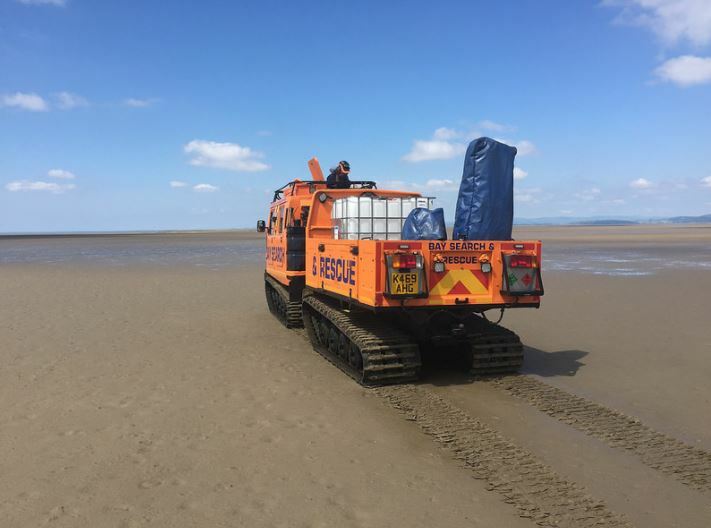 A man had been trapped overnight for 10 hours, held upright in quicksand, and was rescued only just in time as the tide approached. 32 rescuers, including coastguards, paramedics and firemen had carried their equipment on foot for an hour to reach him in extreme wind and rain. Rescuers feared they would see the badly hypothermic man drown before they freed him from the mud. Gary Parsons and Adrian Swenson, two of the coastguards involved, were deeply affected and resolved that the Bay must have the resource to reach people like this. BS&R was formed with the purchase of a hovercraft: this reduced the hour-long walk over the sands to a 12 minute journey. The Hovercraft was replaced by the first Hagglund over twelve years ago, when BS&R realised that an even greater capability was required. Four of these vehicles now form an exceptional asset for local rescues and emergencies in the North and nationwide. BS&R has developed its logistics, specialist vehicles and expertise to provide essential services over the whole Bay, and has unique capabilities developed in response to serious flooding and major snow events in Cumbria and further afield. Alongside rescues, it can deliver welfare into flood areas, access cut off homes, even rescuing animals and livestock. BS&R works alongside Emergency Services all over the North West, and is one of the organisations listed as a ‘national asset’ with DEFRA for emergency scenarios. As such it is called on across the UK in response to extraordinary weather events (snowstorms, major floods and moorland fires) and challenging rescues in hostile environments (vehicle or helicopter crashes in remote areas for instance). An extraordinary environment has given rise to an extraordinary service, now valued nationally for its unique abilities.